On Sunday, the EU and Turkey will be negotiating over the future of Syrian refugees. 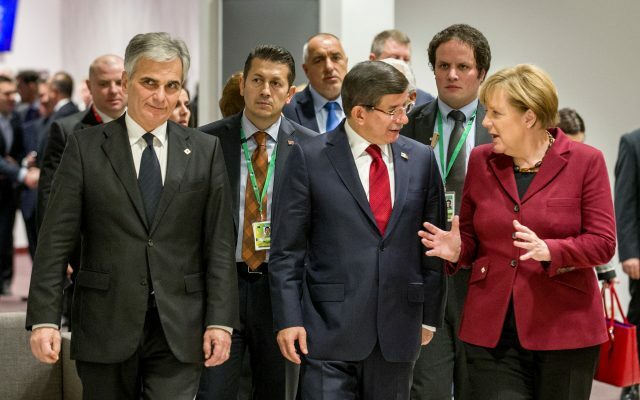 In return for the containment of Syrian refugees within its borders, which is what Chancellor Angela Merkel has asked during her October 18 visit to Istanbul, the Turkish government is asking for the easing of visa restrictions for Turkish citizens, the revival of Turkey’s long dead EU accession process and financial assistance. Already politically and morally contentious, the deal has become all the more critical after the Paris attacks. Let’s start with the Syrian refugees whose future is being negotiated upon. On 30 October, only twelve days after Merkel’s visit, Ibrahim Abd al-Qader and Fares Hamadi were found beheaded in their apartment. They were young activist journalists from Raqqa, the ISIS stronghold in Syria. They were working for “Eye on the Homeland”, a Syrian media collective, and Ibrahim was a member of “Raqqa Is Being Slaughtered Silently”, a citizen-journalist organization documenting ISIS abuses in Syria. What is particularly noteworthy about the beheading of Ibrahim and Fares is that it occurred in Turkey. This was the first time ISIS has targeted Syrian refugees in Turkey, proving how long its arm reaches across the border. Ibrahim and Fares were refugees in the conventional sense; they had “well-founded fear of persecution” owing to their political opinions. They had received death threats from ISIS after their arrival to Turkey. Ibrahim was tortured in an ISIS prison before his escape from Raqqa. Surely, the Turkish authorities knew or should have known that Ibrahim and Fares were targeted by the ISIS. Yet, they failed to protect these political refugees. More critically, Merkel’s deal flies in the face of Germany’s obligations under international refugee law. Turkey retains a geographical reservation to the UN Refugee Convention, granting refugee status exclusively to those fleeing from Europe and excluding the Syrian refugees from the possibility to seek asylum in this country. The recently introduced ‘temporary protection regime’ does not confer on Syrian refugees a solid legal status in Turkey, and renders them vulnerable to unfavorable policy changes in the future. Amnesty International’s recent reports on Turkish border guards’ forced return of refugees to Syria and Iraq, a clear violation of the non-refoulement principle under the Refugee Convention, show once again how ill-suited Turkey is to provide protection to refugees. The living conditions of Syrian refugees in Turkey are also a matter of concern. Certainly, Turkey has borne a substantial financial cost in hosting over 2 million registered Syrian refugees since it opened its borders in March 2011. On the other hand, the over 7 billion USD the government reports to have expended seems to be money not well spent. According to official figures, only 12 percent of Syrian refugees live in refugee camps; the remaining 88 percent are trying to make ends meet by begging on the streets, sleeping outdoors or in squatted vacant buildings, unable to access basic public services. According to a Human Rights Watch report released on November 8th, more than two thirds of Syrian children do not receive any formal education. Instead, girls are forced into marriages while boys work in sweatshops for extremely low wages without social security. Then, there is the question of designating Turkey as a “safe country of origin” in exchange of its cooperation in border management. Ibrahim and Fares were not the only victims of ISIS in Turkey. Over the course of the summer, ISIS militants holding Turkish nationality fatally attacked the election rallies of the pro-Kurdish Peoples’ Democracy Party (HDP) and carried out suicide bombings against its activists and sympathizers, killing over 100 protestors at a peace rally on 10 October in the capital Ankara. Far from providing a safe refuge for Syrians whom it does not recognize as refugees, the Turkish government has utterly failed in protecting its Kurdish and leftist citizens who have been the sole and repeated targets of ISIS in Turkey. Finally, perhaps it’s time to talk about the elephant in the room. Can and should Chancellor Merkel trust a government whose sympathy, tolerance and active support of ISIS and other extremist Islamist organizations in Syria is an open secret? Such support has ranged from the treatment of wounded ISIS terrorists in Turkish hospitals to the transfer of arms under the disguise of ‘humanitarian aid’ across the border, from turning a blind eye to thousands of European jihadists crossing the Turkish border to join ISIS to allowing the jihadists to transport and sell oil from IS-controlled territories. Chancellor Merkel may understandably feel overwhelmed by the domestic backlash to her decision to open Germany’s borders. However, leaving Syrian refugees to the mercy of a government which is unable and unwilling to offer them safety and legal protection cannot be the way out for her political problems at home. Or is she willing to forgo fundamental democratic values and legal obligations under international law to save herself? Dilek Kurban, JD., is the co-chair of the Dahrendorf Working Group “Europe-Turkey Relations”. She is a Marie Curie Fellow at the Hertie School of Governance in Berlin and a member of the European Commission’s Network of Independent Experts in the non-discrimination field as the Turkey expert.